Description: Described as Bent and Obverse Scratched, but it is actually quite a nice half dime. The bend is virtually undetectable, and the scratches are hardly noticeable. Light to medium original tone. 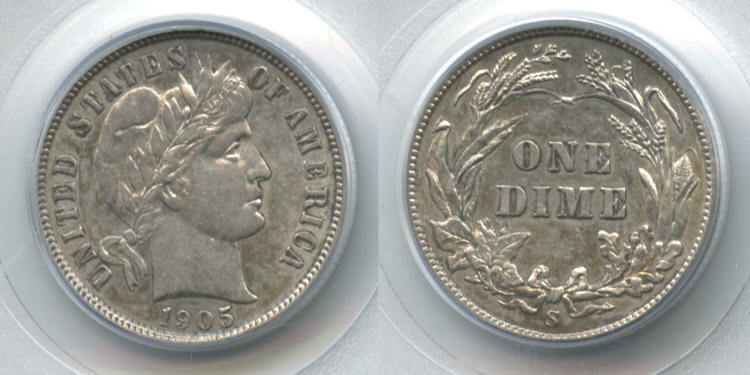 This half dime has great detail, with nearly Uncirculated details on the obverse. All the hair strands are clearly visible, top to bottom. This is certainly about the nicest small eagle half dime you will find for under $5000! The variety is LM-1, Rarity-3, Likerty on the obverse. Click here for 300 dpi image of the whole slab. Click here for 1200 dpi image of the coin only. Description: Light even pitting. Excellent detail, especially on the obverse, with nice blue rim tone. Priced as a VF-20. Description: Attractive light toning. One year type with hollow stars on the obverse. Description: Medium to dark reddish gray tone, quite even. No obvious reason why it only received a -60 grade. Maybe it just lacks the pizzazz of a higher grade. Description: Untoned and mark free, it should easily upgrade to MS-65. Old green holder. Description: Nice untoned, perfect for the grade. Description: Nice frosty white. Priced as MS-64. Description: Light to medium tone. Description: White with tiny traces of rim tone. Description: Antique silver gray color. Description: AU-53 Details, cleaned. Not harshly cleaned at all, it retains an attractive silver gray color without annoying hairlines. A reasonably attractive piece, priced as an Extra Fine. Description: A much better date Proof quarter despite the large original mintage of 1000 pieces. At the beginning of 1862, over 600 of those coins remained available for sale, and were melted rather than being kept in the Mint's inventory providing a net mintage of under 400 pieces. This coin was actually struck on April 15, 1861. In terms of appearance, the scan came out rather awful. In reality, it is medium toned, with the obverse being 2/3 blue and 1/3 gold, and the reverse being 3/4 blue and 1/4 rose. I wish I could figure out a better imaging system! Description: I like reeded edge halves a lot. They are much scarcer than the lettered edge halves, which were hoarded in huge quantities at the time of issue. This is a very decent specimen, and grades a full MS-63+ or better with the exception of a small planchet flaw just past the second 8 in the date. This is a mint made flaw which really does not affect the technical grade, though it does affect the price. SEGS graded this coin MS-63, and I am net grading it to MS-61, and selling it for exactly half of the MS-63 price. Nice original coin with a sharp strike, and bargain priced at MS-60 Bid. Description: Extremely rare. Mintage 10 pieces. Excellent mirrors with a few minor scuffs accounting for the 60 grade. Description: One of the more available of the early dates in Mint State condition, but still far scarcer than most of the 1900's issues. The obverse has some light gold, and the reverse is essentially white. A well above average specimen with clean surfaces and flashy luster. Description: Some light tone, mostly near the rims. Description: White obverse over a nicely toned reverse. The reverse has a reddish hue with some bluish color on the right side. Very clean and mark free. Description: White centers with attractive light gold near the rims, especially on the reverse. Clean surfaces. Description: Lustrous and attractive with near white centers and light gold rim tone with a hint of blue. My grade is MS-65, and the price reflects that grade. Description: Accurately graded, with clean surfaces. Medium gray tone, as noted on the slab. The toning actually makes the reverse quite attractive. Description: No problems, decent eye appeal. Hard to locate without problems. Only the slightest trace of adjustment marks on the reverse, not at all distracting. Some original luster remains. Excellent color, as so many of these early coins are very dark. Bargain priced as an EF-40. BB-125 or Bolender-8. Die state II with the usual weak obverse stars. Some specimens are completely missing a star or two, though all stars are clearly visible on this piece. This is the only variety this year that has four berries on the olive branch on the reverse, and the berries are relatively large. Description: Net graded by half a grade due to two minor obverse scratches. One is on the lower part of the bust and the other is in front of Miss Liberty's face. Both are thin and shallow and not very distracting at all, being well hidden under a very attractive light gold tone. The light gold color is enhanced by luster remaining in protected areas. No adjustment marks and scarce as such. Discounted by $2400 or about 1/3 due to the minor scratches. The variety is BB-188 or Bolender-8. 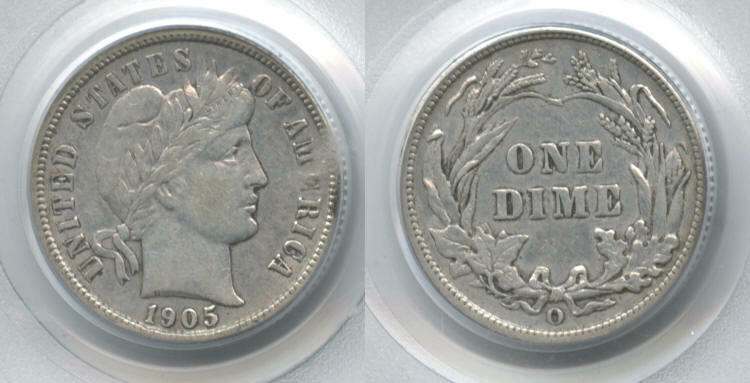 Obverse die markers include a dot inside the lower left part of the R in Liberty. The reverse is also easy to identify as the three upper stars on the right do not touch the clouds while the three on the left each have one point touching the clouds. Die state I. Description: Beautiful tone! Reddish gold obverse with some blue near the rim. The reverse is mostly near white with just some nice rim tone. Description: Medium toned obverse over a white reverse. Kind of hard to describe, but it appears to be mostly a blue - gold obverse with maybe a trace of reddish. Click here for 600 dpi image of the coin only. Description: Near white with a bit of gold. Clean surfaces, very clean cheek, lots of luster. Description: Mostly near white with a few bits of toning. Lustrous. Description: Bright white with decent mirrors. Description: Undergraded with attractive toning. Description: White other than traces of rim tone.